The Mackie ProFX8v2 8-channel USB mixer means you can stop sacrificing sound quality for portability at your solo and acoustic gigs. At Sweetwater we believe every you gig you play can sound great, and the ProFX8v2 packs that great sound along with the features of a large format mixer into a size that makes sense. You get four of Mackie's new Vita preamps for your mic, guitar, keyboard, or anything else you need to do your show. After you've plugged in, tap into the powerful ReadyFX effects engine to add finesse to your mix. Show your audience you care by giving them the best sound you can with the Mackie ProFX8v2 USB mixer. Like the name says, the ProFX8v2 is a professional mixer, with convenient features and sound that rivals that of some larger format mixers. Mackie designed the Vita preamps with live sound in mind to provide the quality of sound that is lacking in some compact mixers. Each channel features its own individual 3-band EQ and 100Hz low-cut filter for shaping the sound of your inputs. The ReadyFX digital effects engine gives you access to 16 different effects including reverbs and delays - Mackie even added chorus effects for your guitar. A 7-band graphic EQ can be assigned either to your main outputs so you can fine tune the PA or the aux output to easily get rid of feedback in your monitors. If you perform with backing tracks there are inputs (including USB) for your laptop or MP3 player, a headphone output with individual level control, and when you add to all that phantom power for your condenser mics and the convenience of a hi-Z input for direct instrument input, you have no reason NOT to own a ProFX8v2. Yes, the ProFX8v2 is exactly what you need for mixing when the gig calls for minimal inputs, but that's not where its usefulness ends. Since you'll be mixing from the stage, keep the ProFX8v2 right next to you and you can use the headphone output with a set of in-ear monitors for your performance and just leave your floor monitors at home. Drummers can use it for monitoring too - take the aux mix from the front of house board that would have gone to your wedges and plug it in to a channel on the ProFX8v2. Once your mix is set you have complete control over sound shaping and volume without having to get the attention of the mix engineer. Keyboard players, you can use it to mix your multi-instrument rig straight into your amp onstage. Even audio-visual professionals working in conference breakout rooms and convention general sessions will find the functionality and connectivity of the ProFX8v2 an easy, great-sounding solution - when you're working in a room with a 70-volt system, the 7-band graphic EQ will come in especially handy! Ever walk into a venue to set up and been pointed to an old Mackie mixer in the corner, covered in years of smoke, dust, and bar goo? Are you surprised when you plug in, fire it up, and rock your gig? You shouldn't be! Mackie has been making solid, roadworthy gear for decades and the ProFX8v2 is no different. In fact, the gear just keeps getting better. Built like a tank? Indeed! With solid steel chassis construction and super-tough ABS side protection you'll be playing through your ProFX8v2 for years to come. With all the right tools for the job, the ProFX8v2 allows you to create memorable mixes, but even with all those features, portability is paramount and you can't be burdened with lugging around additional equipment. No worries, integrated USB I/O takes the pain out of recording. Just connect the ProFX8v2 to a laptop, start up your included copy of Tracktion music production software (or almost any DAW software) and you can record the whole mix. You can even stream music from your laptop during breaks. 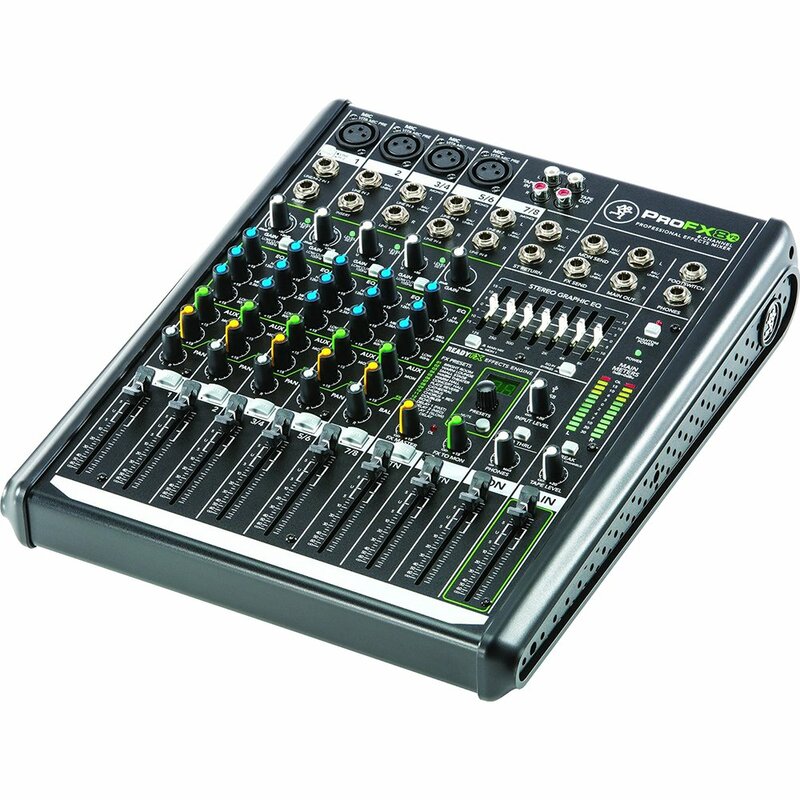 Get the channel count you need and the sound quality you want with Mackie's ProFX8v2 mixer!